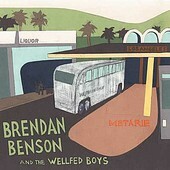 Detroit singer-songwriter Brendan Benson's latest, the Metarie EP, is the first to be released with his touring band, The Wellfed Boys' name attached. Including two versions of the title track, one with the Wellfed Boys backing him (the version that made the U.S. release of Benson's Lapalco, his second full-length, and comeback record). And another found on the UK version of Lapalco, and including three other tracks - "Alternative To Love", "You're Quiet", and "Let Me Roll It" - Metarie is yet another stunning collection (albeit small) of Benson's brilliance. The latter three songs are jangle-y, guitar-driven, crunchy songs that verge on power-pop. Though they remain more Beatles than Cheap Trick, with "Let Me Roll It" sounding more psychedelic than its two predecessors, steaming in the its slight psychedelic mood, as it incorporates garage rock and even the blues into its pop shell. Benson, along with the Wellfed Boys, creates effortless, smiling pop songs that can just as easily rock out, making you sing along no matter what they're doing. Benson's Lapalco was one of the best records of 2002, and Metarie hints at another slab of brilliance to come this year. I'll give this an A-.